I have been very fortunate to be invited to write a guest post for the online version of The Times. Sarah Ebner writes and edits the fantastic “The School Gate” education section and is as passionate as we are about early childhood education. 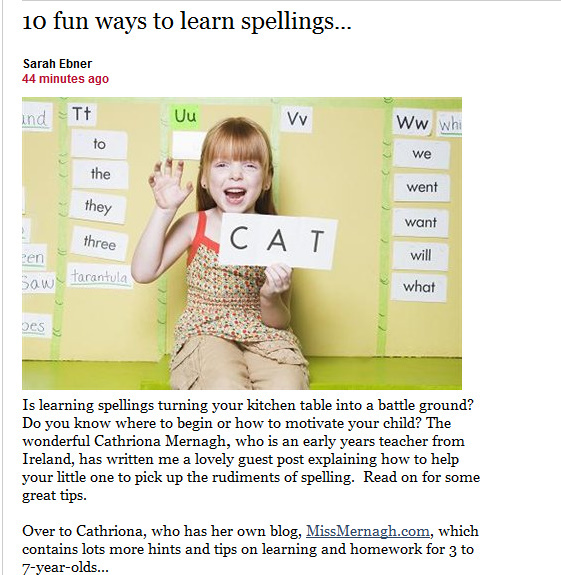 My post, 10 Fun Ways to Learn Spellings, is sure to be of interest to anyone with a young child. Check it out on http://www.thetimes.co.uk/tto/education/schoolgate/. I would love to hear your feedback so please leave a comment at the end of the article or on my website. Well done Miss Mernagh ! An inspiration to parents who want to make their kids learning fun. Elaine. Thanks Elaine! I am just thrilled that Sarah Ebner gave me such an opportunity. I hope that homework will be more fun for lots of children from now on. Thanks for your kind comments. I too work a lot with children who have Dyslexia. Playing games is a great way to build in lots of repetition and reinforcement. You game looks interesting and is so colourful! Hello ~ I just stumbled onto your great blog!! I however am unable to read your article!! Any suggestions!! It looks GREAT! Thanks for all you do! Unfortunately , the article from The Times is in a pay-per-view section of their website. It only costs £1 to subscribe for the day and explains the steps in learning to spell along with my Top Ten Tips. I have lots of tips and games that you can read and download for free in the Spelling section here. If you subscribe you will get all updates and never miss out! I am delighted that you like my blog. Thanks for taking the time to leave a comment. I am always happy to help :). Is there anything that you would like to see on the site? I am open to suggestions.